Following yesterday’s Facebook announcement that the social media behemoth had made a $A11.4 billion profit in the second quarter of 2017, comes new research showing how Zuckerberg’s little tech co. is as dominant and relevant as ever. 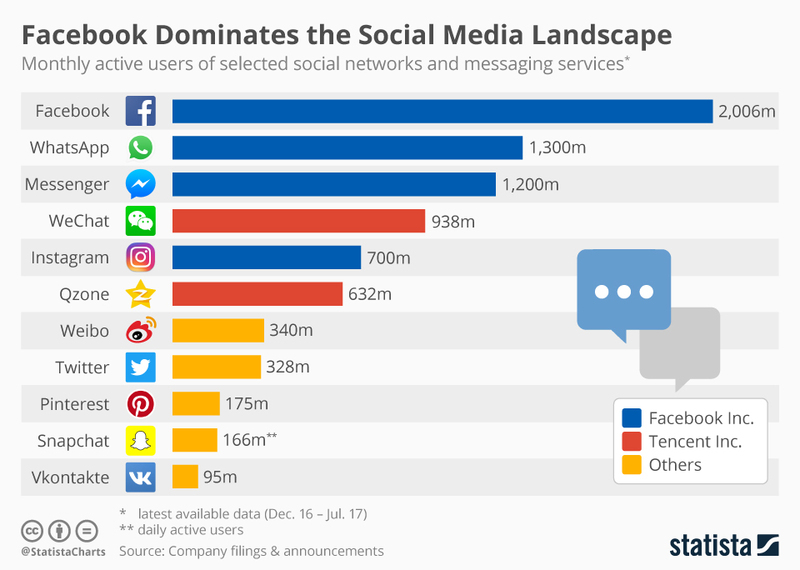 The chart below, produced by online statistics and market research firm Statisata, shows Facebook now runs four of the five most used social network and messaging services in the world, including WhatsApp, Messenger and Instagram. This means Facebook will continue to control the dollars from advertisers who want to target particular people’s interests. Facebook has already warned that it’s hitting peak ad saturation in your Facebook feed, meaning it will need to find new revenue streams via things like Facebook Messenger and WhatsApp.